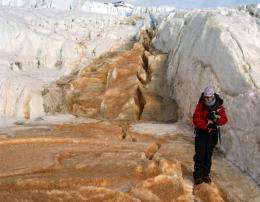 (PhysOrg.com) -- A reservoir of briny liquid buried deep beneath an Antarctic glacier supports hardy microbes that have lived in isolation for millions of years, researchers report this week in the journal Science. The discovery of life in a place where cold, darkness and lack of oxygen would previously have led scientists to believe nothing could survive comes from a team led by researchers at Dartmouth and Harvard. Their work was funded by the National Science Foundation, NASA, and Harvard's Microbial Sciences Initiative. Despite their profound isolation, the microbes are remarkably similar to species found in modern marine environments, suggesting that the organisms now under the glacier are the remnants of a larger population that once occupied an open fjord or sea. "It's a bit like finding a forest that nobody has seen for 1.5 million years," says Ann Pearson, Thomas D. Cabot Associate Professor of Earth and Planetary Sciences in Harvard's Faculty of Arts and Sciences. "Intriguingly, the species living there are similar to contemporary organisms, and yet quite different -- a result, no doubt, of having lived in such an inhospitable environment for so long." "This briny pond is a unique sort of time capsule from a period in Earth's history," says lead author Jill Mikucki, now a research associate in the Department of Earth Sciences at Dartmouth and visiting fellow at Dartmouth's Dickey Center for International Understanding and its Institute of Arctic Studies. "I don't know of any other environment quite like this on Earth." Chemical analysis of effluent from the inaccessible subglacial pool suggests that its inhabitants have eked out a living by breathing iron leached from bedrock with the help of a sulfur catalyst. Lacking any light to support photosynthesis, the microbes have presumably survived by feeding on the organic matter trapped with them when the massive Taylor Glacier sealed off their habitat an estimated 1.5 to 2 million years ago. Mikucki, Pearson, and colleagues based their analysis on samples taken at Antarctica's Blood Falls, a frozen waterfall-like feature at the edge of the Taylor Glacier whose striking red appearance first drew early explorers' attention in 1911. Those "Heroic Age" adventurers speculated that red algae might have been responsible for the bright color, but scientists later confirmed that the coloration was due to rust, which the new research shows was likely liberated from subglacial bedrock by microorganisms. Because water flows unpredictably from below the glacier at Blood Falls, it took Mikucki a number of years to obtain the samples needed to conduct an analysis. Finally, in the right place at the right time, she was able to capture some of the subglacial brine as it flowed out of a crack in the glacial wall, obtaining a sample of an extremely salty, cold, and clear liquid for analysis. "When I started running the chemical analysis on it, there was no oxygen," she says. "That was when this got really interesting. It was a real 'Eureka!' moment." The fluid is rich in sulfur, a geochemical signature of marine environments, reinforcing suspicions that the ancestors of the microbes now beneath the Taylor Glacier probably lived in an ocean long ago. When sea level fell more than 1.5 million years ago, they hypothesize, a pool of seawater was likely trapped and eventually capped by the advancing glacier. The exact size of the subglacial pool remains a mystery, but it is thought to rest under 400 meters of ice some four kilometers from its tiny outlet at Blood Falls. Mikucki's analysis showed that the sulfur below the glacier had been uniquely reworked by microbes and provides insight into how these organisms have been able to survive in isolation for so long. The research answers some questions while raising others about the persistence of life in such extreme environments. Life below the Taylor Glacier may help address questions about "Snowball Earth," the period of geological time when large ice sheets covered Earth's surface. But it could also be a rich laboratory for studying life in other hostile environments, and perhaps even on Mars and its ice-covered moon, Europa. "But it could also be a rich laboratory for studying life in other hostile environments, and perhaps even on Mars and its ice-covered moon, Europa." Um... Europa's not a moon of Mars. That's just frikkin' cool. I'm hanging out for the day we find life on another planet/moon. Every discovery like this one just makes it more and more inevitable. Have to agree. Although everyone would like to think their science will "change everything", this is the sort of discovery that might lead to "changing our understanding of life beyond imagination". LOLOLOL Absolute fail by the article. How could they make such a mistake? LOTS of speculation here: When sea level fell more than 1.5 million years ago, they hypothesize, a pool of seawater was likely trapped and eventually capped by the advancing glacier. The exact size of the subglacial pool remains a mystery . . . etc., etc. The Biblical model is more logical. Creation scientists would suggest there was 1 Ice Age and this ecosystem described above has existed for just centuries. Furthermore there is absolutely no evidence that there is life outside planet Earth. Agreed, there's considerable speculation here. That's what scientists do - find some data, speculate about it, then test their speculations further. However, the speculation about 1.5 million years and so on is consistent with the gargantuan preponderance of other physical evidence regarding the age of the Earth and the universe. The Biblical model is at odds with that same gargantuan preponderance of evidence, which is why I think it's a bunch of baloney. Wow, that is a pretty funny mistake. On another note. Do we really need evidence? People don't need solid proof of god... Unless you think that's what a banana is. I mean it is shaped perfectly for eating. yeah, it's just a matter of time before we damage that ecosystem too. the day that PhysOrg starts posting articles from the Creationist Scientists is the day I stop visiting this site! That's a pretty persuasive point. You know what else - yesterday I saw a mud puddle, and the hole it fit into was perfectly shaped to fit it. Coincidence? Or evidence of an intelligence that goes around creating holes perfectly designed for puddles?